Enjoy a real western tailgate party. 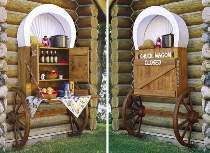 This wagon has a large cabinet to hold supplies. Gate folds down to make a generous serving platform. Can be used in the family room or outdoors as pictured. Wagon is made mostly from "1x4" and "1x10" boards. Wheels are cut from plywood. Top is made from a white bed sheet. Plan includes FULL SIZE patterns for the wheels and lettering. Scale drawings are provided for all other parts. Cabinet measures 30"H x 35"W. Wheels measure 36"H.